Producing hard-to-get organic chemicals is now as simple as assembling Ikea furniture, according to a group of chemists at the University of Glasgow. The team’s latest adventure into 3D-printed reactionware spawned small modules that slot together to do 12 process steps. Team leader Lee Cronin foresees organic chemists developing modules that enable non-specialists to easily make substances experts might now have to slave away at to synthesise. ‘The chemist now becomes a digital designer,’ Cronin tells Chemistry World. Cronin’s team previously showed that 3D-printed custom polypropylene reactionware is robust enough to produce metal–organic frameworks (MOFs) at temperatures exceeding 100˚C. ‘I’ve been challenged by people who say “It’s much harder to do organic chemistry,”’ Cronin says. To prove the concept but avoid illicit use, Cronin and his colleagues developed a blueprint for the cheap and readily available muscle relaxant baclofen. They designed five opaque cylindrical modules, each holding up to 32ml, with openings in their tops to let material in. Through second openings in their tops users can apply pressure to force reaction material through openings at the modules’ bottoms. The chemists also gave the chambers ports through which users can introduce nitrogen, providing reactions with inert atmospheres. The Glasgow researchers printed modules on Ultimaker 3D printers, which cost as little as £1350. They paused the printing to insert magnetic stirrer bars for modules in which reactions happen, hydrophobic filters in those where extractions happen and fritted glass filters in filtration modules. They could then heat or cool and stir modules using conventional stirrer hotplates. Otherwise, the setup is more like a mini-chemical plant than the Pyrex-based glassware often seen in fumehoods. ‘The chemist doesn’t have to get their hands dirty,’ Cronin says. Starting from 200mg of commercially available methyl 4-chloro-cinnamate, the first module added a carbon and a nitrogen atom through a Michael addition reaction. The same module then evaporated solvent and did a simple solvent extraction purification. 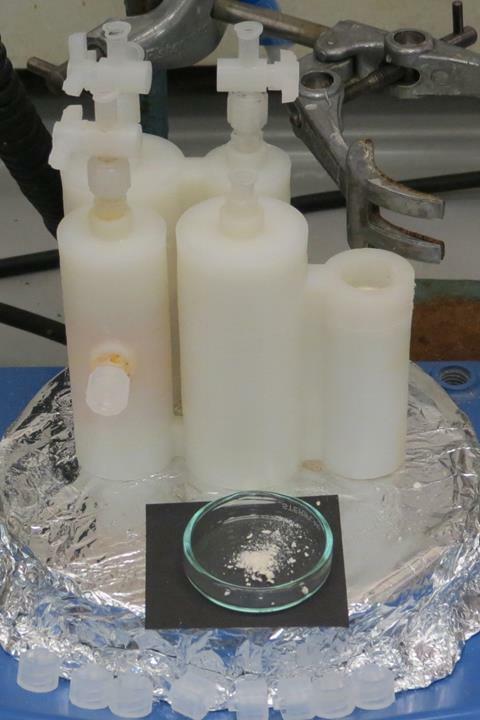 The second module reduced the molecule, formed it into a new ring, and exchanged solvents before another solvent extraction in the third module. 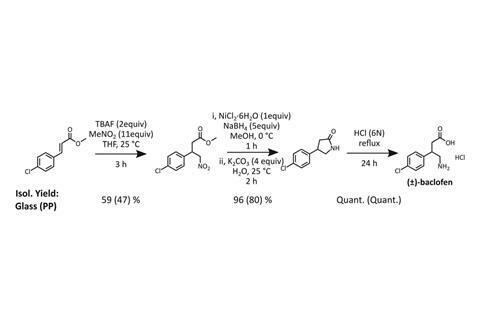 The fourth module exchanged solvents again to reopen the ring and make baclofen. The final module, which is open so that users can retrieve their product, crystallises the molecule as a solid and filters it out, avoiding more expensive purification options. 40 hours after the process started the chemists scraped out 98mg of baclofen, which exceeded 95% purity. Yet the UK’s Medicines and Healthcare Regulatory Authority (MHRA) must currently inspect every single manufacturing location for drugs sold in the country, underlines an MHRA spokesperson. However, they add that innovations can create new business and regulatory models, for example by collaborating with the MHRA’s Innovation Office. While its focus is on new medicinal products, or improved existing products, the MHRA is ‘open to such novel manufacturing technology’ if it consistently meets required standards, the spokesperson notes. Victor Sans Sangorrin from the University of Nottingham, UK, calls the paper ‘fantastic’ with ‘a number of breakthrough aspects’. Even a key limitation – polypropylene’s incompatibility with some conditions – could be seen as a strength. The chemistry still works and the milder conditions polypropylene imposes are more desirable anyway. ‘This work represents an impressive leap forward’ and could deeply influence the ways synthetic routes are devised and implemented, Sans says.